PeraBell Food Bar, the offshoot of a popular Patchogue spot, has become an instant hit in Riverhead. Pizza from the restaurant’s wood-burning oven is a must; request the pizza menu if you’re not given one. Other standouts include creamy mac and four cheeses, a first-rate “chophouse” burger, crisp-skinned half chicken and, for dessert, creme brulee. Lunch: Monday to Saturday, 11 a.m. to 3 p.m. Dinner: Monday to Thursday, 3 to 10 p.m., Friday and Saturday, 3 to 11 p.m., Sunday, noon to 9 p.m. Wheelchair accessible through street entrance. PeraBell Food Bar, the offshoot of a popular Patchogue spot, has been warmly embraced by downtown Riverhead. At 5:30 on a week night, the hip newcomer is already packed. Weekends, it throbs. Lots of brick and wood define the interior; outside, a capacious rear patio with a river view becomes a plus in warm weather. 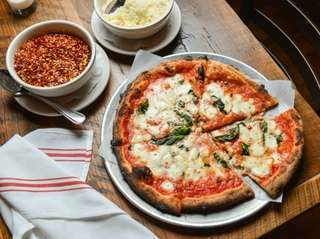 An asset year-round is the restaurant's wood-burning pizza oven, the province of executive chef John Peragine. Yet, oddly enough, pizzas aren't on the regular menu. During an initial visit, the pizza roster -- a laminated card -- isn't mentioned by the server; the second time, it takes two requests to procure it. So, do what you must to get your hands on the beautifully charred puffy-crusted Margherita pie, reason enough to eat here. You'd also do well to start with the rich baked mac and four cheeses, its crunchy top flecked with chives and bacon. But you'll want to bypass Tex-Mex empanadas, whose chicken-chipotle-cheese filling doesn't come together well. Perfectly good Thai glazed grilled short ribs are tarted up with pickled cabbage and served atop ramen noodle crisps. Simplicity would seem in order here. Lots of lobster meat in the lobster salad-bacon sliders, but their brioche buns are too thick and dry. Not to be missed is PeraBell's exceptional burger -- thick, smoky, crusty, beefy and juicy. And, praise be, the meat is served on a well-proportioned bun. Another standout is savory, crisp-skinned roasted chicken with mashed potatoes and spinach. Duck confit ravioli -- actually cheese ravioli topped with duck confit and wild mushrooms -- is a hearty choice for winter. While you may want to forego fettuccine with shrimp and way too many other ingredients, a special of house-made spaetzle with autumn vegetables and bacon is a winner that should be part of the everyday lineup. While amateurish service here points up the need for better training, there's certainly talent in the kitchen. This comes through in a simple but opulent crème brûlée whose burnt sugar crust crackles at the touch of a spoon. One mouthful and you know not only what PeraBell is but what it can become.